Since your faxes are received through your email, you no longer need to print them. You can save the fax or forward the fax to someone else's email. Printer toner is expensive and if you use thermal paper, the faxes usually need to be re-scanned and reprinted for filing because thermal paper fades over time. Fax to email eliminates these problems. Since your fax machine is no longer used to receive faxes, the lifetime of your existing fax machine is extended. Your business no longer needs different lines for different individuals or departments, each person within your business can get their own dedicated 086 fax to email number, saving you the costs and hassles of more phone lines to deal with your incoming faxes. The cost and time of setting up new fax lines each time you move is eliminated, not to mention the issuing of new fax numbers. Your free 086 number moves with you. Time is money, and by receiving your faxes in your email eliminates the need to check your fax machine for new faxes. A major problem with shared fax machines is privacy and the "disappearing" faxes. There is also the problem of paper running out, paper jams and all the hassles and hazards of faxes. With your own personal 086 fax number, your faxes get to your mailbox without the jamming paper, the prying eyes or sticky fingers. As an optional extra on your free fax to email service, one of the services offered is the email to fax or document to fax service. 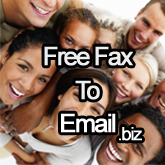 This service allows you to send faxes to anyone in the world, right from your desktop. Costs do apply for this optional service and software installation may be required.